Embossed Star Pins with Butterfly Pin attachment available in Gold, Silver & Brass. Approximate size 0.75 inches. 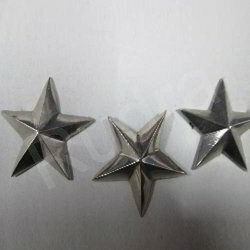 We are engaged in manufacturing, exporting and supplying a wide range of Police Uniform Star. The provided belt buckles are precisely designed and manufactured using high grade raw material and latest techniques. Owing to their fine finish and durability, these belt buckles are widely appreciated by our precious clients. police star in used bag and badge also. back side pin type. 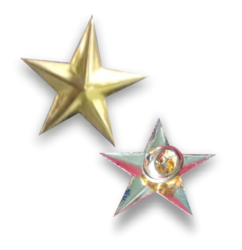 Engaged in manufacturing and supplying star pin.